If you work at SEEK and don’t know that user research happens every week you’ve been hiding under a rock. Mimi Turner, our researcher, advertises and advocates research, along with the UX designers within their product teams. The research calendar is up to date, and colour coordinated, emails are sent inviting the core team and those interested in UX to the sessions, and the schedule for the day is posted on the observation room. When not busy doing research, Mimi has presented on UX Research at SEEK to build our research culture. When a particular feature is being tested, we invite the developers, testers, product owners, product managers, digital analysts and delivery managers involved in that component to watch the research from the observation room. These sessions are also open to anyone else interested from anywhere in the company, from Sales, Marketing, HR, Customer Service, etc. Sometimes we’ll lure an observer into a session from them simply walking past and seeing a real live user using our product on the TV screen in real time. However, with meetings, regular work and other commitments it can often be hard for folks to attend these sessions. I personally try to work from the observation room for at least 2 sessions if I can, to half-watch while I do other work. When it’s my research, I’ll most likely be in the room taking notes and more actively listening. 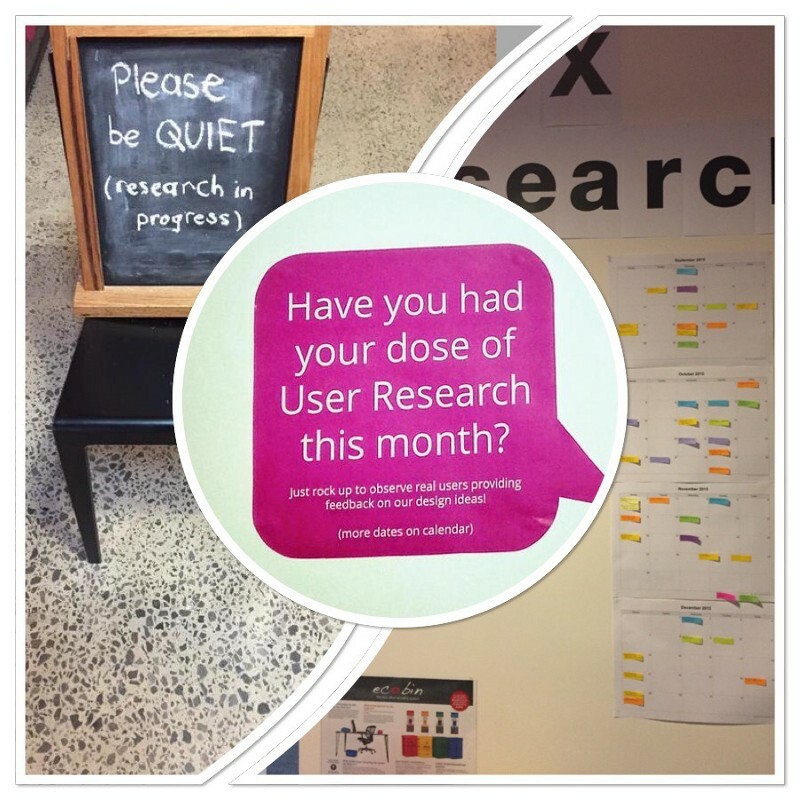 Each user research session has a 2-page document of key findings circulated afterwards, and a session with the project team to run through the results in more depth. This document is sent to the core team, and anyone else who observed the session and wanted to be kept in the loop. All findings are also stored in a central space where anyone at SEEK can access it. Hearing something ‘straight from the horse’s mouth’ builds more empathy than reading it in a formal findings report. We capture verbatim quotes from research participants that sum up their feelings or thoughts, and send them along with a picture of the participant, with the findings. These are also posted up around the office. We include a (real) picture to put a face to the quote and build greater empathy and understanding. If a picture is worth a thousand words, then a video highlights reel is worth a million. Every user research session is recorded. We never post these videos anywhere public, and we almost never go back and watch the full sessions. No-one has time to sit down and watch 5–10 user research sessions with a running time of at least 45 minutes each. If you’re too busy to observe a session then you can surely spare 2,3,4 minutes to watch a highlights reel that articulates the key points. When I started making the highlight reels and showing them to the team they gained a much better understanding of our users. Watching these videos is a powerful way to build real empathy. When you watch a video you see the real person, hear their voice, and see them struggle. This is much more effective at building empathy for the users, and getting things fixed, than just explaining the problem. When the developers see real people, with real problems struggling to use something they created, they want to rush back to their desks and fix the problem, real fast. Oh, and we also do monitor calls (for product improvement purposes) and empathy building — Senior UX Designer Vedran Arnautovic explains here.